Investigate the rumors of a Goblin army being gathered by Lord Helseth. 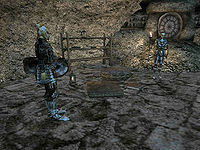 Speak with Fedris Hler in the Temple: Reception area and receive his orders to track down two Goblin Warchiefs and, optionally, two Altmer trainers. Speak to anyone in town about the Goblins to learn that they have been seen in the Godsreach Sewers. 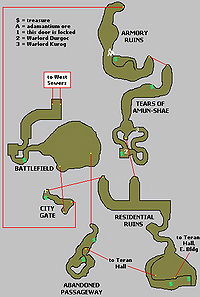 Explore the Sewers and connected Dungeons. Find the two Warchiefs in the Tears of Amun-Shae section. The two Altmer can be found in the bottom of Teran Hall, East Building. Return to Hler for your reward. You meet with Fedris Hler in the Temple Reception, following directions by any guard, after killing the leader of the Dark Brotherhood. Though you still don't know why you were targeted by the Brotherhood, Hler will ask you to help track down a Goblin army supposedly being prepared by King Hlaalu Helseth, the newly crowned King of Morrowind. You must kill the two Goblin Warchiefs, and two Altmer trainers if possible, and return to Hler. The Goblins are armed with hard-hitting, yet brittle weapons and may use Restore Health potions when hit. Several areas can be reached from multiple paths so you don't necessarily need to explore all of the above, though there is no harm in doing so. The areas have a good number of various Goblins and those Durzogs which you must face. Many of the Goblins will use Restore Health magic which makes fights all the more interesting. Many of the creatures will respawn if you return later, so the safest bet is to completely clear an area before continuing on. Also as a warning, watch out for the invisible pit trap in Teran Hall, an interesting addition even if it does kill you. You can reach the Tears of Amun-Shae via the Residential Ruins or the Armory Ruins. Warchief Durgoc is located in the southern portion of the Old Mournhold: Tears of Amun-Shae section of the expansive dungeon. Close by, Warchief Kurog is wandering the tunnels. Durgoc carries the Durgok's key (yes, the name is written differently) which open a closed chest next to his location where you can find a unique Goblin Buckler. There is a good hoard of loot in the waterfall area (including an Adamantium Axe), reached only by levitation. The two High Elven trainers, Yarnar and Armion, can be found in the bottom of Teran Hall, East Building in the Residential Ruins area. Alternatively, you can reach the area from the bottom of Teran Hall, behind a 100 pt. lock. They are relatively close together, but you might want to separate them in order to fight them one-on-one. They can be a handful if they attack you together. Report back to Hler in the Temple: Reception area. If you killed both Warchiefs and both Altmer trainers you will receive a whopping 15,000 gold as your reward. If you killed both warlords but only one trainer, Fedris Hler will comment "Shame you didn't get the other one" and reward you with 10,000 gold. If you only killed the Warchiefs, the reward will be even less, a meager 5,000 gold. Speak to Hler again and offer to be of further service to our Lady and you'll be directed to Gavas Drin, the Lord Archcanon, in his office here at the Temple. The warchiefs are rather strong. A good strategy would be to trap them behind the many rocks jutting out from the walls, and then either paralyze and whack away, or cast ranged magic at them. Unfortunately for mages, the goblins are semi-resistant to magic. You don't need to complete the Hunt the Dark Brotherhood quest to start this quest. After coming to Mournhold you can speak to Fedris Hler to get this quest immediately. At any given time, you can start the Hunt the Dark Brotherhood quest, just by speaking to the people. 10 Fedris Hler, Almalexia's Chief Steward, has asked me to perform a service for the goddess. It seems that King Helseth is recruiting a troop of goblins to serve as footsoldiers for his army. 20 According to Hler, Almalexia considers the goblins an abomination, and is horrified that Helseth would consider using the beasts as soldiers. The goddess worries that the temperamental Helseth will lose control of the creatures, and they will attack Mournhold. I am to kill the goblin warchiefs and report back to Hler. Although he did not know where the goblins were being trained, perhaps one of the locals has more information. 30 In addition to the two goblin warchiefs, Hler mentioned that there are at least two Altmer in charge of training the goblins for Helseth. If I can also get rid of them, the goddess will be pleased. 40 There have been reports of strange creatures in and around the sewers of the Godsreach area of Mournhold. It could be where the goblins are hiding. 50 I've killed the two goblin warchiefs. 57 I've killed the Altmer trainer Armion. 58 I've killed the Altmer trainer Yarnar. 100 Finishes quest Fedris Hler has told me that the goddess Almalexia is very pleased to hear that the goblin menace has been taken care of. As a token of gratitude, I have been given a large sum of gold as a reward.